(CNN) -- Sending 21,000 more troops to Afghanistan is the centerpiece of the Obama administration's strategy for winning there . Commanders say victory is achievable, but those in the field expect a long road ahead. 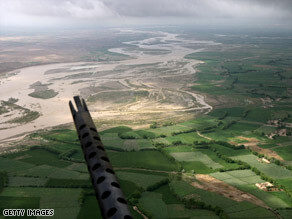 A machine gun points out from a U.S. Marine helicopter flying over southwest Afghanistan. CNN exclusively joined Gen. James Conway, commandant of the Marine Corps, in southern Afghanistan to get a firsthand look at where the fight is headed. Right now, 39,000 U.S. troops are on the ground in Afghanistan, and in the weeks ahead, 8,000 Marines will join the fight. In announcing his strategy for the region last month, President Obama said that more troops, new legislation, improved troop training and added civilian expertise are needed to fight terrorism in Afghanistan and Pakistan. U.S. Army Brig. Gen. James Nicholson said there are some places where the Taliban are now in control. "There are some areas because we haven't had, to date, sufficient forces on the ground," he said. Obama said last month that U.S. soldiers and Marines "will take the fight to the Taliban in the south and east" and will work with Afghan troops along the border. Gen. David McKiernan, commander of the International Security Assistance Force, said that, for now, "it remains stalemated in the south." "The insurgency has grown dramatically over the last year," said Adm. Michael Mullen. Conway predicted that casualties among U.S. troops will rise over what they have been. Michael Hastings, a contributor for GQ magazine who just returned from the Afghanistan-Pakistan border, said he felt a sense of skepticism among U.S. commanders and soldiers in regard a long-term strategy in Afghanistan. "I think there is skepticism whether or not this is a good thing to do in the long run," he said. Insurgents are launching increasingly sophisticated ambush attacks. Roadside bombs are the No. 1 killer, and mine detectors haven't been working as well as predicted. Conway is concerned that there won't be enough helicopters to quickly evacuate wounded Marines from the battlefield, as fighting is expected to occur in remote locations. The United States has intelligence that top Taliban and insurgent leaders in Afghanistan and Pakistan are joining forces. U.S. troops are looking for one man in particular who goes by the battlefield name Zakir. He was released from the U.S. detention center at Guantanamo Bay, Cuba, and U.S. troops think he is now operating in southern Afghanistan. Asked whether Zakir, released from the military prison camp two years ago, is a serious threat, McKiernan said, "Absolutely, and we are seriously after him." The Obama administration is sending thousands of extra troops and billions of dollars in aid, but still, commanders warn, there could be years of battle ahead.